Instant Pot Gingerbread Oatmeal is sure to bring all the holiday feels. Gingerbread isn’t just for dessert anymore; we’re making breakfast festive. It’s been a minute since I last popped in with a recipe. I took a nice long break over Thanksgiving week and it was so nice to unplug and focus on spending time with my family. I hope you all had a great holiday with those you love. As much as I love Thanksgiving (how could I not love a holiday that revolves around food?) I’m so ready for Christmas. This is our first Christmas in our new house and it’s been so fun to decorate and hang the stockings on the mantle. 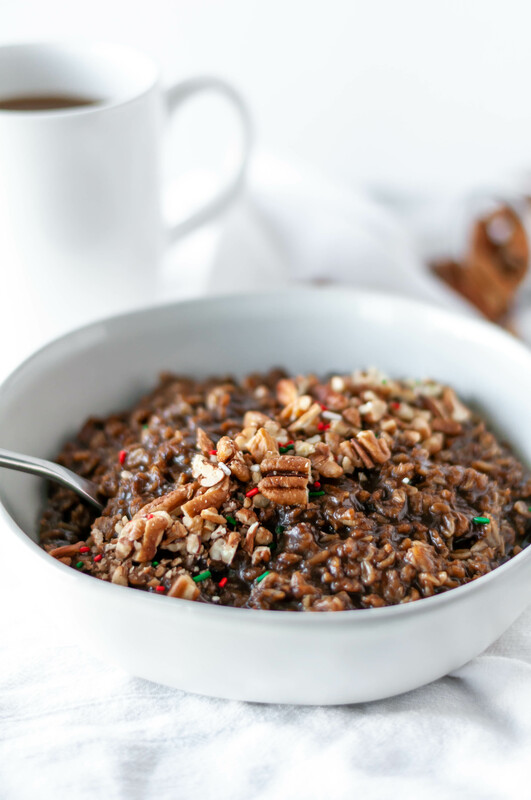 A few weeks ago we got into the Christmas spirit with this Instant Pot Gingerbread Oatmeal. This was my first attempt to make oatmeal in the instant pot and it was a big success. The oats cooked perfectly and didn’t require attention and stirring like they would on the stovetop. They cook in 5 minutes with a 5 minute natural release so you could throw the ingredients in and finish getting ready for the day while it cooks. I’m all about having lots of super low maintenance, easy breakfast options. Especially when they put you in the Christmas spirit. This oatmeal seriously tastes just like a gingerbread cookie. Just healthier. When you can get away with eating something for breakfast that tastes like dessert you’re definitely winning at life. The rich molasses, ginger and warm spices emulate the gingerbread flavor. I cooked the oats in water and a few splashes of heavy cream to add some smooth, creaminess to the finished oatmeal. If you don’t want to buy heavy cream just for two tablespoons, you could sub with milk or even just water. They’ll still be delicious, I promise. I always like some crunchy texture in my oatmeal so I added some chopped pecans on top. This is totally optional since it’s not a gingerbread ingredient. Another optional but highly recommended garnish is Christmas sprinkles. They really drive home the cookie vibes. Plus, who doesn’t want an excuse for a little sprinkles in their life? Instant Pot Gingerbread Oatmeal will bring all the holiday spirit. Tons of gingerbread flavor packed into breakfast for a healthy spin on a holiday favorite. Combine all ingredients expect the pecans and sprinkles in the Instant Pot. Lock lid into place and seal pressure valve. Set to manual high pressure for 5 minutes. Once done, allow for 5 minutes natural release. After 5 minutes, carefully release the remaining pressure by turning the valve. Top with chopped pecans and Christmas sprinkles, if desired.